I created a short program to directly measure the clock rate of an Intel CPU. It runs, sleeps for a duration specified by the user, and then measures the number of clock cycles and the amount of time that elapsed while it was asleep, then divides the elapsed clock cycles by the elapsed time to get the frequency of the CPU. Is the below code up to stuff in terms of style and readability? Is there any reason the strategy used and described below won't produce accurate results? //Uses assembly command to get the current value of the cycle "counter"
There are a number of things that you might employ to improve your program. Yes! There are many reasons, which are each enumerated separately in items below, followed by more general information about code style and structure. While it would be lovely to actually have a processor that fast, my laptop does not, so this result is incorrect. What std::this_thread::sleep_for(delay) does is to sleep for at least delay but it may be longer, depending on what else the operating system and the underlying hardware are doing at the moment. This means that there is a variability in the results of the program. An example of one thousand runs of the program is shown plotted below. While in this case, most of the results were around the correct value of 2494.225 MHz, the results vary. The alternate way to do this would be to use a hardware-based timer instead and run the timing code as part of the kernel with interrupts disabled. 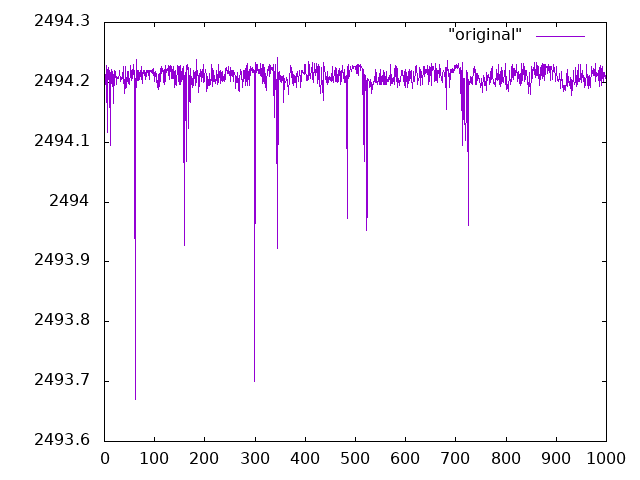 The variability of this program as it currently stands is such that it doesn't matter, but when attempting to do precise timing using the RDTSC instruction, it's important to understand that the processor does out-of-order execution. This means that instructions preceding or following the RDTSC instruction may actually be part of the duration of the event you're trying to measure unless precautions are taken. What is generally used is a serializing instruction such as CPUID to eliminate such effects. Intel has a useful whitepaper that describes this in detail and how to apply it. What follows is more general advice about the coding style and structure. The program_name and start_time variables are global variables. It's generally better to explicitly pass variables your function will need rather than using the vague implicit linkage of a global variable. If they must be globals (which is not the case here), then make them static. It's not wrong as it is, but I'd probably write that using explicit uint32_t sizes for hi and lo to eliminate the possibility of a compiler with a 16-bit unsigned int. There are three problems with that from the user's point of view. First, it doesn't tell the user the unit of measure for the measurement duration. Is it seconds? Minutes? Microseconds? The user would have to look at the source code to answer that question. Second, it could reasonably be interpreted to be two arguments, both of which are optional. Putting an underscore instead of a space would fix that. Third, the word "measurement" is misspelled. It's not wrong to use printf but using iostreams is both more C++-like and can actually save some runtime processing. To evaluate printf, the computer has to interpret the format string first, while using << means that the compiler has already evaluated the argument type at compile-time. Not the answer you're looking for? Browse other questions tagged c++ assembly benchmarking or ask your own question.